(2005) "Welcome to the Black Parade"
"Welcome to the Black Parade" is the first single and fifth track from My Chemical Romance's third studio album, The Black Parade. It was released on September 11, 2006, on iTunes and October 9, 2006, on CD. It is the band's eighth single. The studio version was available on Myspace on September 2, 2006. It was named one of the Rock and Roll Hall of Fame's 500 Songs That Shaped Rock and Roll. The music video for the single was recognized as MTV's "Greatest Music Video of the Century" in 2017. The cover art of the single is the only artwork where the band appears, with the exception of the cover art for "The Ghost of You", where they are shown as silhouettes. An early demo containing elements of the song was titled "The Five of Us Are Dying". The Black Parade as shown in the music video. The video for the single was directed by Samuel Bayer, known for his work with Nirvana and Green Day. The music video was released on September 26, 2006, in the UK and Canada, and was released on September 27, 2006, in the U.S. It was heavily played on MTV. It features the Patient (the main character of the album, played by Lukas Haas) dressed in a hospital gown, and being taken by death in the form of a "Black Parade". On the main float stands My Chemical Romance playing "Welcome to the Black Parade". Behind the float are dozens of masked figures. All the costumes were designed by Academy Award Winning costume designer Colleen Atwood. The setting of the music video transitions from a hospital room to a surreal cityscape with ash-covered wreckage, black snow and destroyed buildings. The video features four of the main characters: the Patient, Fear, Regret, and Mother War. Mother War is the woman in the Victorian-era gown and gas mask. The video tells a basic version of the story behind The Black Parade quite closely. Gerard Way has said that it is "the definitive video for the record" which "summed up the album". In the music video bassist Mikey Way can be seen with a medal on his jacket. This is thought[according to whom?] to be related to his death in the music video for "The Ghost of You". The song became the group's first number one in the UK on October 15, 2006, staying there for two weeks, and later rose to number one on the Modern Rock charts on October 26, 2006, where it would stay for seven weeks. It is the band's most enduring success and their highest-charting single to date on the Billboard Hot 100, peaking at number 9. The song ranked at number 17 on Rolling Stone's "The 100 Best Songs of 2006". It was nominated for the Kerrang! Award for Best Single. The song was made downloadable for Rock Band and Guitar Hero: Warriors of Rock. ITV used the song in a video montage in its final Formula One broadcast at the 2008 Brazilian Grand Prix, after losing the rights to broadcast F1 in 2009 and beyond to the BBC. The video featured several prominent F1 drivers (such as Nico Rosberg, Jenson Button, Rubens Barrichello, David Coulthard and Sebastian Vettel) as well as ITV presenters (and retired commentator Murray Walker) lipsynching to the song. The song was also used by the Los Angeles Kings during the 2012 Stanley Cup Playoffs as part of a video intro at the team's home games. The song also opened the team's Stanley Cup Champions rally and banner raising ceremony at the Staples Center. The song debuted on the Billboard Hot 100 at number 71 for the chart week of September 30, 2006, becoming their highest debut for a single. It peaked at number 9 on the Hot 100 in its 17th and 18th week on the chart, becoming the band's first and only top ten Hot 100 hit. "Welcome to the Black Parade" became and currently is their highest-charting single, beating their 2005 single "Helena" at number 33, their second-highest-charting single. In addition, it topped Modern Rock Tracks for seven weeks in a row, and is the band's only number one on this chart to date. "I'm Not Okay (I Promise)" was their previous highest-charting single on Modern Rock Tracks, where it peaked at number 4. The single knocked Razorlight's "America" off the number one single spot on Sunday, October 15, 2006, in the UK after extensive airplay, becoming the band's first (and as of 2017, only) number one in the country. The single was number 26 in the UK's top 40 singles of 2006, selling 169,000 units. The song was certified Gold in the UK on June 6, 2014, representing sales of at least 400,000 copies. All songs written by My Chemical Romance. ^ Ashley Burns. "'Middle School' Is A Mash-Up Of Every Pop Punk Song You Won't Admit You Once Loved". UPROXX. Retrieved May 6, 2017. ^ Jeremy Gordon. "10 Years Later, My Chemical Romance's The Black Parade Still Speaks to Emo Internet Kids". Spin. Retrieved August 26, 2015. ^ "EMO: Welcome to the Black Parade". The Independent. Retrieved May 6, 2015. ^ "Top 10 Alt-Rock Videos From 2006". Diffuser.fm. Retrieved May 6, 2015. ^ "Experience The Music: One Hit Wonders and The Songs That Shaped Rock and Roll | The Rock and Roll Hall of Fame and Museum". rockhall.com. Retrieved 2016-05-29. ^ "My Chemical Romance Win MTV's Greatest Video Of The Century! | MTV UK". Retrieved 2017-07-02. ^ "Lessons In Marketing: What Is The Black Parade?". So More Scene. July 29, 2006. Archived from the original on February 21, 2009. ^ "The 100 Best Songs of 2006 : Music News". Rolling Stone. Retrieved May 6, 2015. ^ "Certified Awards". Retrieved May 6, 2015. ^ "The 100 Best Songs of the Year". Rolling Stone. ^ "Top 10 Everything: Songs". Time Magazine. Retrieved December 20, 2006. ^ "Top 50 Hard Rock Songs of the 21st Century". Loudwire. Retrieved July 2, 2012. ^ "My Chemical Romance win MTVs Greatest Video of the century". Loudwire. Retrieved July 4, 2017. ^ "Australian-charts.com – My Chemical Romance – Welcome to the Black Parade". ARIA Top 50 Singles. ^ "Ultratop.be – My Chemical Romance – Welcome to the Black Parade" (in Dutch). Ultratop 50. ^ "My Chemical Romance Chart History (Canadian Hot 100)". Billboard. Retrieved August 13, 2018. ^ "ČNS IFPI" (in Czech). Hitparáda – Radio Top 100 Oficiální. IFPI Czech Republic. Note: Change the chart to CZ – RADIO – TOP 100 and insert 20076 into search. ^ "Danishcharts.com – My Chemical Romance – Welcome to the Black Parade". Tracklisten. ^ "Top 100 Music Hits, Top 100 Music Charts, Top 100 Songs & The Hot 100". Billboard (in Japanese). ^ "My Chemical Romance: Welcome to the Black Parade" (in Finnish). Musiikkituottajat – IFPI Finland. ^ "Musicline.de – My Chemical Romance Single-Chartverfolgung" (in German). Media Control Charts. PhonoNet GmbH. ^ "Italiancharts.com – My Chemical Romance – Welcome to the Black Parade". Top Digital Download. ^ "Dutchcharts.nl – My Chemical Romance – Welcome to the Black Parade" (in Dutch). Single Top 100. ^ "Charts.nz – My Chemical Romance – Welcome to the Black Parade". Top 40 Singles. 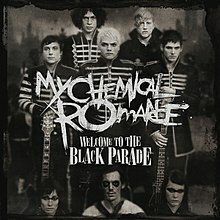 ^ "Norwegiancharts.com – My Chemical Romance – Welcome to the Black Parade". VG-lista. ^ "ČNS IFPI" (in Slovak). Hitparáda – Radio Top 100 Oficiálna. IFPI Czech Republic. Note: insert 20079 into search. ^ "Swedishcharts.com – My Chemical Romance – Welcome to the Black Parade". Singles Top 100. ^ "Swisscharts.com – My Chemical Romance – Welcome to the Black Parade". Swiss Singles Chart. ^ "Official Rock & Metal Singles Chart Top 40". Official Charts Company. ^ "My Chemical Romance Chart History (Hot 100)". Billboard. Retrieved 2013-12-01. ^ "My Chemical Romance Chart History (Pop Songs)". Billboard. Retrieved 2013-12-01. ^ "My Chemical Romance Chart History (Alternative Songs)". Billboard. Retrieved 2013-12-01. ^ "My Chemical Romance Chart History (Adult Pop Songs)". Billboard. Retrieved 2013-12-01. ^ "Pop Rock" (in Spanish). Record Report. 2006-11-25. Archived from the original on 2006-11-24. ^ "2006 UK Singles Chart" (PDF). ChartsPlus. Retrieved August 5, 2017. ^ "ARIA Charts – End Of Year Charts – Top 100 Singles 2007". Australian Recording Industry Association. Retrieved 2011-01-08. ^ "Best of 20107 - Hot 100 Songs". Billboard.com. Retrieved 2007-12-14. ^ "Guld Og Platin November/December/Januar" (in Danish). IFPI Denmark. ^ "Latest Gold / Platinum Singles". RadioScope. Archived from the original on July 24, 2011. Retrieved April 21, 2013. ^ "British single certifications – My Chemical Romance – Welcome to the Black Parade". British Phonographic Industry. Retrieved June 16, 2017. Select singles in the Format field. Select Platinum in the Certification field. Type Welcome to the Black Parade in the "Search BPI Awards" field and then press Enter. ^ "American single certifications – My Chemical Romance – Welcome to the Black Parade". Recording Industry Association of America. Retrieved December 18, 2017. If necessary, click Advanced, then click Format, then select Single, then click SEARCH. This page was last edited on 13 March 2019, at 23:42 (UTC).